The future of the connected home is continuing to evolve, and with more startups pitching products, the ship date of older crowdfunding campaigns hitting customer homes and big name companies warming to the space, I’m starting to see a few trends come together for 2015. I’m sure we’ll see more at CES in January, but based on conversations I’ve had and products I saw at our Structure Connect show last week, here are a few things you can expect on the connected home front. 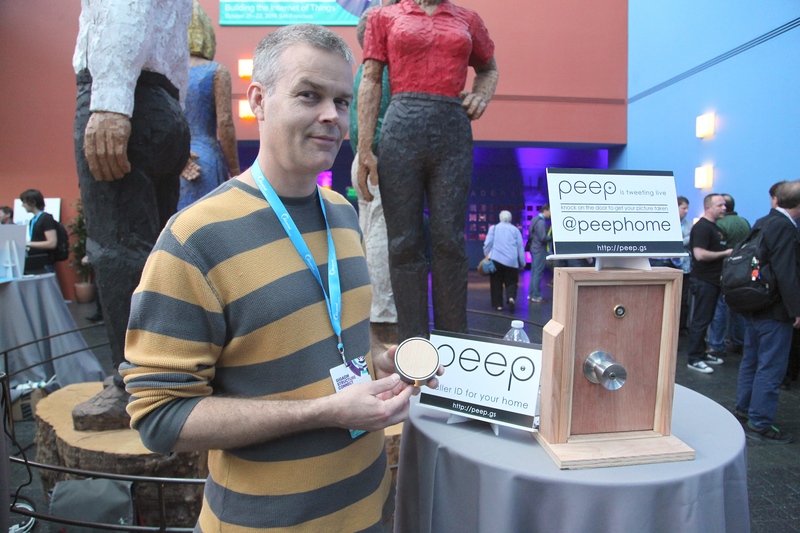 The Peep connected camera may use Bluetooth to send images more quickly than Wi-Fi. Bluetooth makes lighting a snap: At long last, products are coming on the market that will let you use Bluetooth to control light bulbs, outlets and more. These products are using mesh networking to make installing a connected light switch as easy as sticking a new plate to the wall using double-sided tape. Products from Avi-on (which is building bluetooth switches for GE’s Jasco brand), Oort, and Seed will change the way we use lighting in the home and at work. 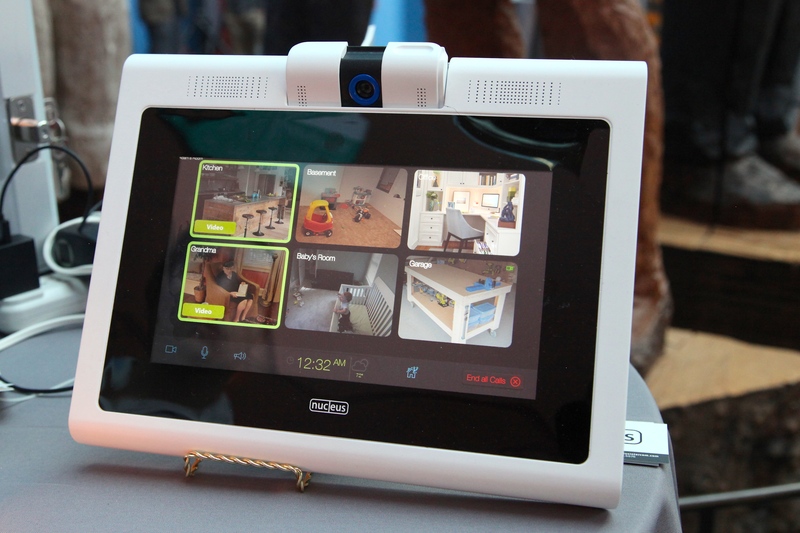 Even Peep, a company showing off a camera that snaps a picture when someone knocks on your door is looking at using Bluetooth as a faster way to get an image to people inside the home, since using Wi-Fi means it would go from the connected camera to the cloud and then to people’s phones. An intercom system from Nucleus lets you use your phone to tell your home what to do. To talk to your home, you’ll talk to your phone: This isn’t a trend I’m excited about, but it’s obviously where we are heading in the relative near term. Since our phones are equipped with awesome natural language processing already, big companies such as Nest and Apple and small ones like Nucleus and Ubi will use them to let people control their homes via voice. For example, Nest will integrate with Google Now’s speech recognition while Apple’s HomeKit is sure to have a Siri component. On the startup side, the Nucleus intercom system showed off a way to not only message people in your house, but to speak into the phone to control your lights. Ubi is building similar functionality into it’s app. Roost’s low-power Wi-Fi helps keep this battery connected for five years. Low-power Wi-Fi is coming even if the standard isn’t ready: Two companies, Homeboy and Roost were offering different products that took advantage of low-power Wi-Fi. The benefits of such a set up are pretty obvious — you don’t need a fancy hub to control a device and it can work for almost everyone. 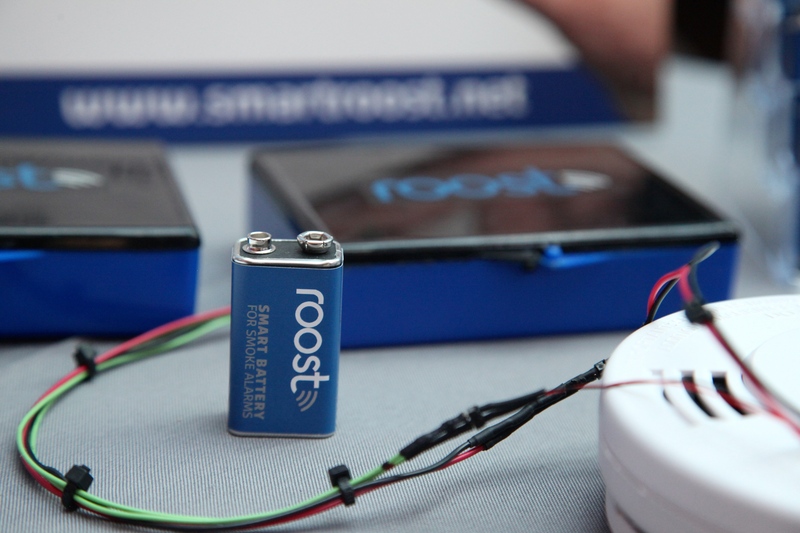 The Roost is a connected battery that lasts for about 5 years and can convert an existing smoke detector into a connected smoke detector. The Homeboy camera was a rechargeable security camera that lasts for 3 months before needing a top off. Both companies have built their own low power Wi-Fi IP as opposed to waiting for the 802.11ah standard to actually come out. 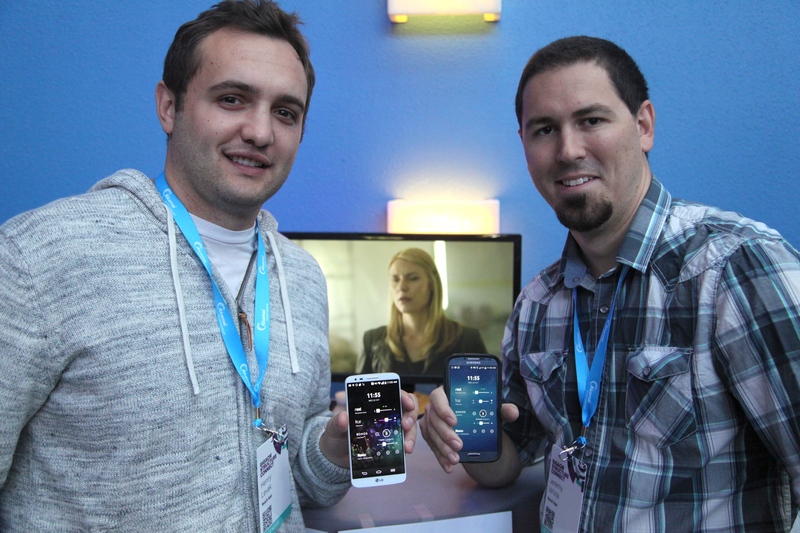 The founders showing off the alpha version of the Reach app at Structure Connect. You won’t need a home hub to automate your house: This year’s hot device, the home hub that combines a bunch of radios with a software platform to let people control multiple connected devices is going away. Even SmartThings CEO Alex Hawkinson is ready to build software that is independent of the company’s hub, although he admits it may take some time and won’t include all the devices out there. I also saw a startup, showing off an Android-based controller called the Reach app that lets people pause videos, play songs over their Sonos and control a few other devices like Hue lights. The app is in alpha right now, but I’m eager to see it once it hits beta. Get ready to pay: The business models that have been lacking in several popular services are beginning to crystalize. From Linden Tibbets. 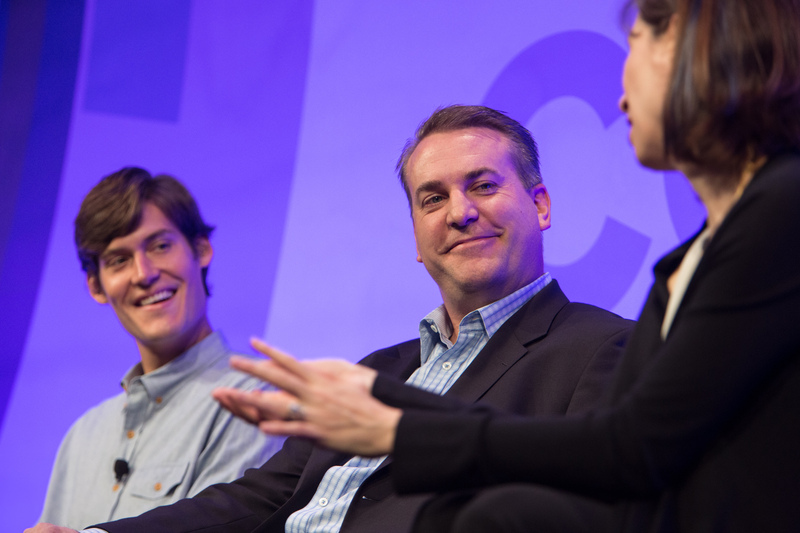 the CEO of If This Then That disclosing that he plans to have consumers pay for premium IFTTT services, to an in-depth discussion from IControl’s CEO on business models for the smart home, it’s clear that while companies have been focused on the user experience, the revenue models aren’t far behind. Really excited to read this. I can see a whole lot of pranks coming from the “talk to your home” development! Loved the article and information. Thanks for posting it.